Can you tell I still think it's June? I can hardly believe we are already over a week into July! My goodness!! My niece, Brittany and her husband, Brad were in town for the first part of June and we had fun traveling around! I'm happy to report that all my outfits with the exception of my lovely Ness Jacket were all me-made! The weather varied quite a bit during this first part of the months so that I got to wear both my wool suit but also my sundress!! Days 9-18 were entirely me-made!! 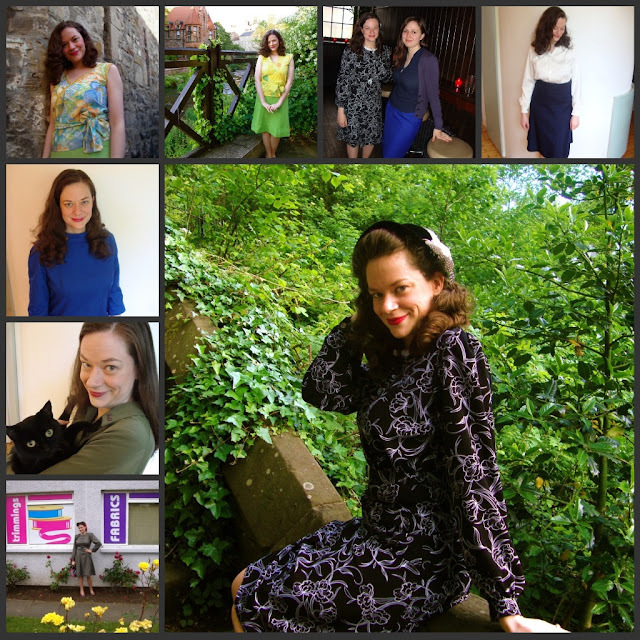 Both of my longer sleeve dresses (the 1939 black and white one and the 1940 grey one were worn twice during the month). I did miss documenting 4 days in the middle of the month! What did I wear then? I wore my 1950's wiggle suit, my pink easter dress, my wool suit again and my high waisted trousers! I really enjoyed days 22-25! I wore my purple parfait dress (I ended up switching out the buttons for purple ones) with my DuBarry blouse and I really liked the combination. I also wore my new refashioned jacket during this week. 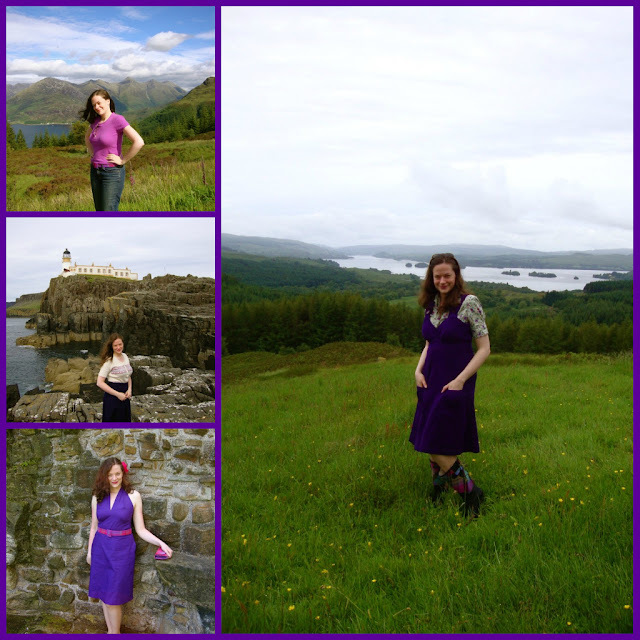 The last days of June were spent touring around Scotland with my sister! I wore my purple parfait again..this time with my Ness Wellies. I also wore jeans (shocking!!) with my me-made (actually David-made) belt. This week also saw the introduction of finally finished halter top and skirt and I got to wear my new Ness Fair Isle sweater with a wardrobe staple--my navy 1940 skirt. Overall, I am quite pleased with me-made June. 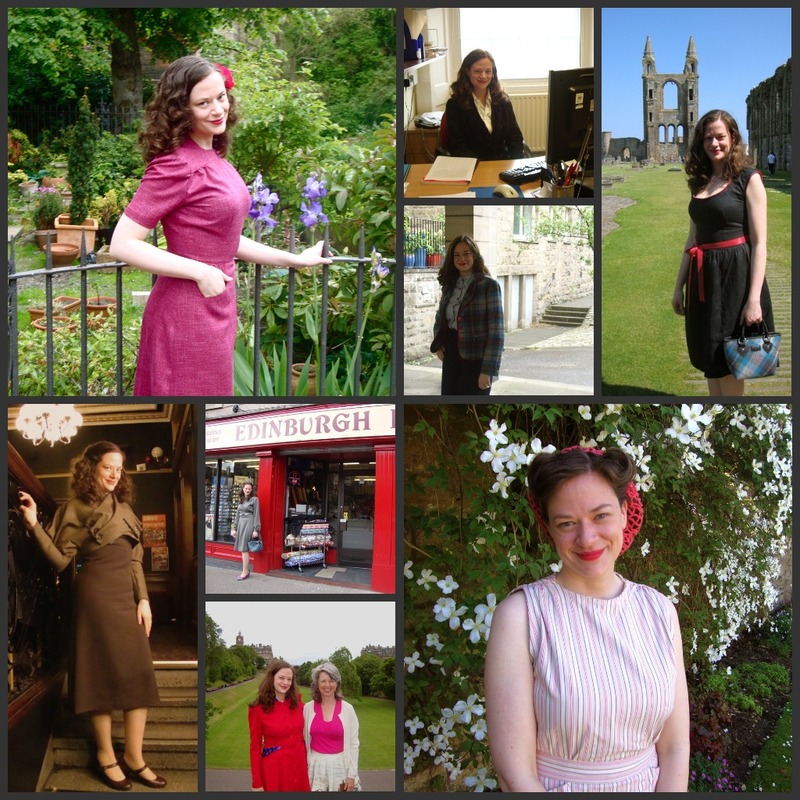 It's amazing how many more me-made outfits I have now as compared to what I had during May 2010. It really makes quite a difference to be able to pull from several different outfits. I'm really glad that I've been sewing to a colour palette both from my 2010 sewing plans but also my spring Colette palette plan. It makes it really easy to wear the pieces that I have made together! The most challenging part of Me-Made June was not wearing what I had made but remembering to document each day! Having the Me-Made challenge during a warmer month was so much better for me in terms of having a chance to wear everything. I was lucky in that June had the full spectrum of Scottish weather from cold, damp days to hot and humid. I thought for sure I wouldn't be able to wear my sleeveless sundresses but I was lucky in that we got one of our warmest days in early June! hurrah! 1) My long sleeved black and white dress. Despite having a few warm days, the weather was very moderate for the rest of the month. The black and white dress that I made for the Sew Weekly Ascot Races challenge was perfect. It's lightweight but having my arms covered kept me just warm enough to be comfortable. 2) My Raspberry Sorbet dress. I love this dress. It's the perfect amount of dress up and casual. It looks chic without being over the top. It's businesslike but also fun. I can pretty much wear it anywhere. I definitely want to make more!! The Colette Parfait dress! I really liked wearing this as a pinafore...more than I thought I would! I ended up switching the silver buttons to purple buttons that matched the fabric better. 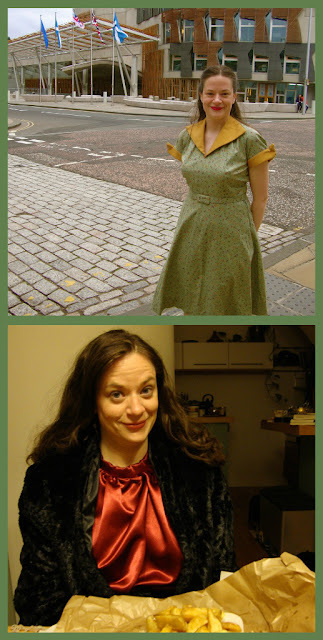 I also really like how the pinafore looks with my 1943 sage green and purple blouse. And I love how it goes with wellies--perfect for walks out in the damp countryside! Definitely an outfit surprise! I definitely thought I would wear my 1935 cape more but it didn't get worn this month! I think I need to make some more 30's inspired skirts and blouses that match the cape. I also thought I would wear my Joannie wiggle dress more. I think once I finish the jacket this will definitely be a wardrobe staple! I've been focussing so much on separates lately that I haven't made a whole lot of dresses even though I really love the ones I have made. I want to make more dresses and more skirt suits as well! Did you participate in Me-Made June? What are the gaps in your wardrobe? Hi Debi,I have been following you (that sounds sort of nefarious, like a lurker....)for a little while and totally admire your style and ambition. Thanks for the MMJ wrap-up, great clothes, nice styling and super photo's. I didn't do MMJ but have thoroughly enjoyed following everyone else. I think MM challenges are wonderful. I read on Zoe's blog that someone had gotten rather snarky about the project. Pity for them because you all are the future of sewing. Bravo. I had made all my clothes for many years I sewed everything I wore. Lately I have spent more time quilting than garment sewing. No matter, Great Month! Love the wrap up! and like you mentioned, I love how you really stuck to your colour palette, it all looks fantastic! I've been inspirired by your pinafore also. I may just have to tack that onto my dangerously long "To-Make" List! I have been trying to sew similar colour clothes too this year. It really does help! I adore that pink dress in the top left of your first photo collage. Seeing the whole month in a collage like this is so inspiring for me. I am only just beginning on my journey into self-made clothes. Thanks, Debi!